A cavern in a salt dome owned by Texas Brine Co., L.L.C. failed and caused gas to leak up through natural formations for months. Texas Brine Co., L.L.C. ignored a letter stating their part of the cavern had failed a pressure test and had continued to drill into the western end of the salt dome. This caused a massive nine-acre sinkhole to open up in Bayou Corne, located in Assumption Parish of Louisiana. 350 residents in the surrounding areas were made to leave their homes in August 2012 and have yet to return home. The company is now agreeing in a buyout for the residents’ properties. 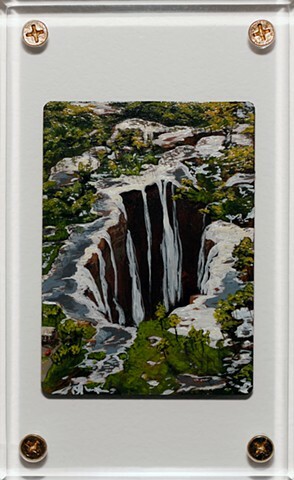 “Brine Falls” is my humor-laden sarcastic vision into the future of the massive sinkhole – a naturally wondrous tourist attraction likened to Victoria (or Niagara) Falls.